WASHINGTON (AP) — Astronomers say they have discovered a hot, star-popping galaxy that is far, far away — farther than any previously detected, from a time when the universe was a mere toddler of about 400 million years old. By employing a different technique — one that has raised some skepticism — a team of astronomers exposed a time period they'd thought was impossible to observe with today's technology. They used the Hubble Space Telescope and found the light wave signature of an extremely bright galaxy 13.4 billion light-years away, according to a study published Thursday by Astrophysical Journal. The margin of error is plus or minus 5 million light-years. A light-year is about 5.8 trillion miles. It shatters old records for distance and time in a big way, and may remain the farthest that can be seen for years, until a new space telescope is launched, the team of astronomers said. With that light signature, astronomers were able to produce a photo of this galaxy that's fuzzy and all-too deceptive in color. It appears darkish red and indistinct, when in reality it's so hot it is bright blue, but the light has traveled so long and far that it has shifted to the very end of the color spectrum, to dark red. And that fuzziness masks an incredible rate of star formation that's 10 times more frenetic than our Milky Way, said study co-author Gabriel Brammer, an astronomer at the Space Telescope Science Institute. "It really is star bursting," Brammer said. "We're getting closer and closer to when we think the first stars formed ... There's not a lot of actual time between this galaxy and the Big Bang." If we were back in time and near this galaxy (named GN-z11), we'd see "blue, stunning, really bright young stars" and all around us would be "very messy looking objects" that are galaxies just forming — not the large bright spirals we think of as galaxies, said study co-author Garth Illingworth at the University of California Santa Cruz. Astronomers measure the distance an object by calculating how much the light changes from blue to red, called redshift. 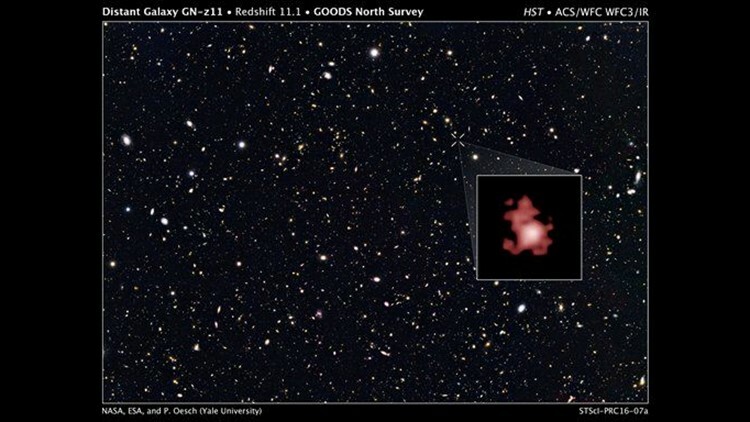 This discovery is of a galaxy with redshift of 11.1; until this discovery, the previous highest redshift was 8.68, about 580 million years after the Big Bang. For a long time, competing teams of astronomers were just trying to reach a redshift of 9, about 550 million years after the Big Bang. But the new discovery blew all that out of the water, surprising the team that found it, said study lead author Pascal Oesch of Yale. The way they did it was different than the old methods of using a standard light wave signature marker, with the spectrum measured precisely by ground telescope. Instead, the team looked beyond that bright line to a longer, but messier light wave spectrum, using what's considered a rougher tool, Illingworth said. Competing astronomer Richard Ellis at the European Southern Observatory, who found the previous record far galaxy, was skeptical. He said the light signatures used by Oesch's teams are "noisier and harder to interpret" and may overlap with competing nearby stars or galaxies. And for GN-z11 to be that visible it would have to be three times brighter than typical galaxies, he said in an email. Oesch said the team made sure "this was as clean as possible a measurement" with little contamination. He said the technique they used is starting to become standard. But Oesch, Brammer and Illingworth said don't expect new discoveries farther and older than this one, because they have pushed Hubble to its limit. Only when the next NASA space telescope is launched and operating, probably in 2019, will astronomers see farther. Astronomer Dimitar Sasselov at Harvard, who wasn't part of the research, called the discovery exciting and interesting: "Seeing and understanding the first galaxies and the first stars is an essential part of our origins story."